NEW YORK, NY–March 6, 2018–From 2014 to 2017, private insurance claim lines with a diagnosis of sleep apnea–a potentially serious disorder in which a person repeatedly stops and starts breathing while asleep–increased by 911 percent in rural America, according to FAIR Health, a national, independent, nonprofit organization dedicated to bringing transparency to healthcare costs and health insurance information. In contrast, urban areas recorded an increase of 839 percent in the same time frame. In the nation overall, claim lines with a diagnosis of sleep apnea grew 850 percent. Rural diagnoses of sleep apnea grew from 0.2 percent of all rural medical claim lines to 1.98 percent. In urban settings, the increase was from 0.13 percent of all urban medical claim lines to 1.24 percent, and in the nation overall, from 0.14 percent of all national medical claim lines to 1.33 percent. FAIR Health's study was based on data from its database of over 25 billion privately billed healthcare claims, the nation's largest repository of private healthcare claim records. The study is particularly timely in light of the recent finding by the National Transportation Safety Board that engineer fatigue resulting from sleep apnea caused a Long Island Rail Road crash in Brooklyn and a New Jersey Transit train crash in Hoboken, New Jersey, the latter of which killed one person. Males are much more likely than females to be diagnosed with sleep apnea. In the period 2016-2017, males accounted for 65 percent of sleep apnea claim lines, females 35 percent. The age group 51 to 60 years accounted for 31 percent of sleep apnea claim lines–the largest share of eight age groups studied. Patients 61 to 70 years old represented 23 percent of claim lines, while those 41 to 50 years old accounted for 20 percent. In 2017, the states with the most sleep apnea claim lines as a percent of all medical claim lines by state were (ranked from most to least) Maryland, Idaho, Utah, Arkansas and Iowa. The states with the lowest proportion of sleep apnea claim lines were (from least to most) New Hampshire, Minnesota, Massachusetts, Vermont and Hawaii. 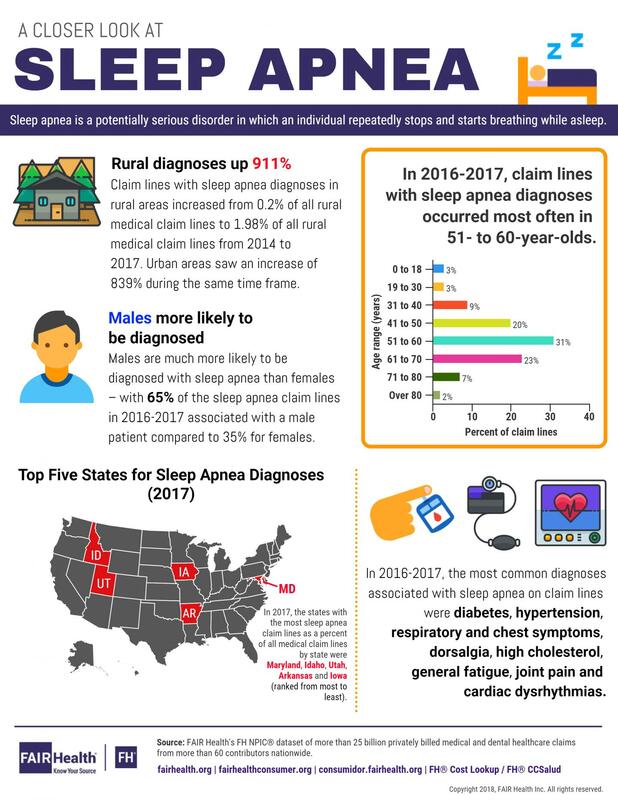 In 2016-2017, the most common diagnoses associated with sleep apnea on claim lines were diabetes, hypertension, respiratory and chest symptoms, dorsalgia, high cholesterol, general fatigue, joint pain and cardiac dysrhythmias. The three most common (and costly) devices associated with sleep apnea diagnoses were (ranked from most to least): continuous positive airway pressure (CPAP) devices, disposable filters used with positive airway pressure devices and headgear used with positive airway pressure devices. "Sleep apnea is a public health issue of increasing interest and concern," said FAIR Health President Robin Gelburd. "FAIR Health is ready to contribute its data resources and analytical capabilities to help researchers, policy makers and others address this issue." FAIR Health is a national, independent, nonprofit organization dedicated to bringing transparency to healthcare costs and health insurance information through data products, consumer resources and health systems research support. FAIR Health possesses the nation's largest collection of private healthcare claims data, which includes over 25 billion claim records contributed by payors and administrators who insure or process claims for private insurance plans covering more than 150 million individuals. FAIR Health also holds separate data representing the experience of more than 55 million individuals enrolled in Medicare. Certified by the Centers for Medicare & Medicaid Services (CMS) as a Qualified Entity, FAIR Health receives all of Medicare Parts A, B and D claims data for use in nationwide transparency efforts. FAIR Health licenses its privately billed data and data products–including benchmark modules, data visualizations, custom analytics, episodes of care analytics and market indices–to commercial insurers and self-insurers, employers, hospitals and healthcare systems, government agencies, researchers and others. FAIR Health has earned HITRUST CSF and Service Organization Controls (SOC 2) certifications by meeting the rigorous data security requirements of these standards. As a testament to the reliability and objectivity of FAIR Health data, the data have been incorporated in statutes and regulations around the country and designated as the official, neutral data source for a variety of state health programs, including workers' compensation and personal injury protection (PIP) programs. FAIR Health data serve as an official reference point in support of certain state balance billing laws that protect consumers against bills for surprise out-of-network and emergency services. FAIR Health also uses its database to power a free consumer website available in English and Spanish and an English/Spanish mobile app, which enable consumers to estimate and plan their healthcare expenditures and offer a rich educational platform on health insurance. The website has been honored by the White House Summit on Smart Disclosure, the Agency for Healthcare Research and Quality (AHRQ), URAC, the eHealthcare Leadership Awards, appPicker, Employee Benefit News and Kiplinger's Personal Finance. FAIR Health also is named a top resource for patients in Elisabeth Rosenthal's book, An American Sickness: How Healthcare Became Big Business and How You Can Take It Back. For more information on FAIR Health, visit fairhealth.org. ent in rural America, according to FAIR Health, a national, independent, nonprofit organization dedicated to bringing transparency to healthcare costs and health insurance information. In contrast, urban areas recorded an increase of 839 percent in the same time frame. In the nation overall, claim lines with a diagnosis of sleep apnea grew 850 percent. * Males are much more likely than females to be diagnosed with sleep apnea. In the period 2016-2017, males accounted for 65 percent of sleep apnea claim lines, females 35 percent. * The age group 51 to 60 years accounted for 31 percent of sleep apnea claim lines–the largest share of eight age groups studied. Patients 61 to 70 years old represented 23 percent of claim lines, while those 41 to 50 years old accounted for 20 percent. * In 2017, the states with the most sleep apnea claim lines as a percent of all medical claim lines by state were (ranked from most to least) Maryland, Idaho, Utah, Arkansas and Iowa. The states with the lowest proportion of sleep apnea claim lines were (from least to most) New Hampshire, Minnesota, Massachusetts, Vermont and Hawaii. * In 2016-2017, the most common diagnoses associated with sleep apnea on claim lines were diabetes, hypertension, respiratory and chest symptoms, dorsalgia, high cholesterol, general fatigue, joint pain and cardiac dysrhythmias. * The three most common (and costly) devices associated with sleep apnea diagnoses were (ranked from most to least): continuous positive airway pressure (CPAP) devices, disposable filters used with positive airway pressure devices and headgear used with positive airway pressure devices. Click here or see below for an infographic on sleep apnea. About FAIR Health FAIR Health is a national, independent, nonprofit organization dedicated to bringing transparency to healthcare costs and health insurance information through data products, consumer resources and health systems research support. FAIR Health possesses the nation's largest collection of private healthcare claims data, which includes over 25 billion claim records contributed by payors and administrators who insure or process claims for private insurance plans covering more than 150 million individuals. FAIR Health also holds separate data representing the experience of more than 55 million individuals enrolled in Medicare. Certified by the Centers for Medicare & Medicaid Services (CMS) as a Qualified Entity, FAIR Health receives all of Medicare Parts A, B and D claims data for use in nationwide transparency efforts. FAIR Health licenses its privately billed data and data products–including benchmark modules, data visualizations, custom analytics, episodes of care analytics and market indices–to commercial insurers and self-insurers, employers, hospitals and healthcare systems, government agencies, researchers and others. FAIR Health has earned HITRUST CSF and Service Organization Controls (SOC 2) certifications by meeting the rigorous data security requirements of these standards. As a testament to the reliability and objectivity of FAIR Health data, the data have been incorporated in statutes and regulations around the country and designated as the official, neutral data source for a variety of state health programs, including workers' compensation and personal injury protection (PIP) programs. FAIR Health data serve as an official reference point in support of certain state balance billing laws that protect consumers against bills for surprise out-of-network and emergency services. FAIR Health also uses its database to power a free consumer website available in English and Spanish and an English/Spanish mobile app, which enable consumers to estimate and plan their healthcare expenditures and offer a rich educational platform on health insurance. The website has been honored by the White House Summit on Smart Disclosure, the Agency for Healthcare Research and Quality (AHRQ), URAC, the eHealthcare Leadership Awards, appPicker, Employee Benefit News and Kiplinger's Personal Finance. FAIR Health also is named a top resource for patients in Elisabeth Rosenthal's book, An American Sickness: How Healthcare Became Big Business and How You Can Take It Back. For more information on FAIR Health, visit fairhealth.org.